From 1st April to 30th April 2019 11.59PM AEDT, sign up with your friend's Refer a Friend Link and make a purchase of an accumulated min spend of $20 to get a $5 Cashback Bonus upon sign up. Cashback Bonus can only be cashed out after you accumulate an extra $10 of confirmed cashback from purchases. 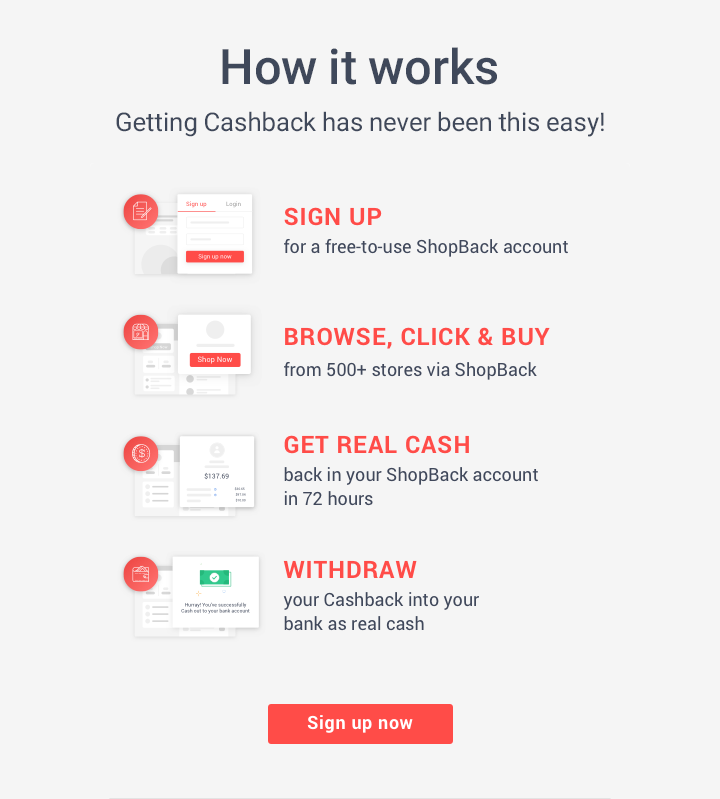 The offer is ONLY open to new members at ShopBack, not valid for existing users. ShopBack reserves the right to immediately close all ShopBack accounts or decline transactions and / or any cash disbursement of members who are in violation or suspected of breach of our Terms and Conditions. From 1st March to 31st March 2019 11.59PM AEDT, sign up with your friend's Refer a Friend Link and make a purchase of an accumulated min spend of $20 to get a $5 Cashback Bonus upon sign up. Cashback Bonus can only be cashed out after you accumulate an extra $10 of confirmed cashback from purchases. The offer is ONLY open to new members at ShopBack, not valid for existing users. ShopBack reserves the right to immediately close all ShopBack accounts or decline transactions and / or any cash disbursement of members who are in violation or suspected of breach of our Terms and Conditions. From 1st February 2019 to 28th February 2019 11.59PM AEDT, sign up with your friend's Refer a Friend Link and make a purchase of an accumulated min spend of $20 to get a TOTAL of $10 Cashback Bonus. 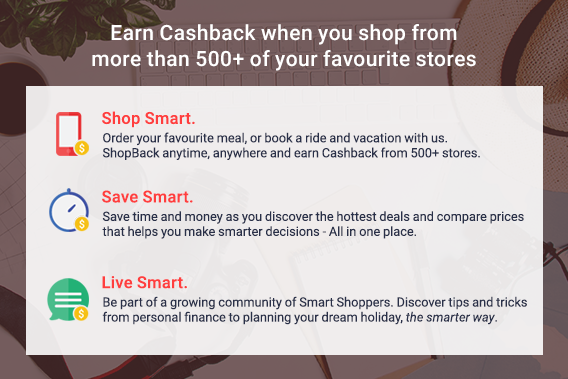 The $10 Cashback Bonus consists of $5 sign up bonus that is credited to your account upon sign up, plus Extra $5 bonus after making an accumulated purchase of more than $20 by 28th February 2019 11.59PM AEDT. The extra bonus will be credited into your ShopBack account by 31st May 2019. Cashback Bonus can only be cashed out after user accumulates extra $10 confirmed cashback from purchases. The offer is ONLY open to new members at ShopBack, not valid for existing users. ShopBack reserves the right to immediately close all ShopBack accounts or decline transactions and / or any cash disbursement of members who are in violation or suspected of breach of our Terms and Conditions. From 4th January 2019 to 31st January 2019 11.59PM AEDT, sign up with your friend's Refer a Friend Link and make a purchase of an accumulated min spend of $20 to get a TOTAL of $10 Cashback Bonus. The $10 Cashback Bonus consists of $5 sign up bonus that is credited to your account upon sign up, plus Extra $5 bonus after making an accumulated purchase of more than $20 by 31st January 2019 11.59PM AEDT. The extra bonus will be credited into your ShopBack account by 30th April 2019. Cashback Bonus can only be cashed out after user accumulates extra $10 confirmed cashback from purchases. The offer is ONLY open to new members at ShopBack, not valid for existing users. ShopBack reserves the right to immediately close all ShopBack accounts or decline transactions and / or any cash disbursement of members who are in violation or suspected of breach of our Terms and Conditions. From 1st November 2018 to 3rd January 2019 11.59PM AEDT, sign up with your friend's Refer a Friend Link and make a purchase of an accumulated min spend of $20 to get a TOTAL of $11 Cashback Bonus. The $11 Cashback Bonus consists of $5 sign up bonus that is credited to your account upon sign up, plus Extra $6 bonus after making an accumulated purchase of more than $20 by 3rd January 2019 11.59PM AEDT. The extra bonus will be credited into your ShopBack account by 31st March 2019. Cashback Bonus can only be cashed out after user accumulates extra $10 confirmed cashback from purchases. The offer is ONLY open to new members at ShopBack, not valid for existing users. ShopBack reserves the right to immediately close all ShopBack accounts or decline transactions and / or any cash disbursement of members who are in violation or suspected of breach of our Terms and Conditions. From 10th October to 17th October 2018 11.59PM AEST, sign up with your friend's Refer a Friend Link and make a purchase of an accumulated min spend of $20 to get a TOTAL of $15 Cashback Bonus. The $15 Cashback Bonus consists of $5 sign up bonus that is credited to your account upon sign up, plus Extra $10 bonus after making an accumulated purchase of more than $20 by 17th October 2018 11.59PM AEST. The extra bonus will be credited into your ShopBack account by 28th February 2019. Cashback Bonus can only be cashed out after user accumulates extra $10 confirmed cashback from purchases. The offer is ONLY open to new members at ShopBack, not valid for existing users. ShopBack reserves the right to immediately close all ShopBack accounts or decline transactions and / or any cash disbursement of members who are in violation or suspected of breach of our Terms and Conditions. From 2nd October to 31st October 2018 11.59PM AEST, sign up with your friend's Refer a Friend Link and make a purchase of an accumulated min spend of $20 to get a TOTAL of $12 Cashback Bonus. The $12 Cashback Bonus consists of $5 sign up bonus that is credited to your account upon sign up, plus Extra $7 bonus after making an accumulated purchase of more than $20 by 31st October 2018 11.59PM AEST. The extra bonus will be credited into your ShopBack account by 28th February 2019. Cashback Bonus can only be cashed out after user accumulates extra $10 confirmed cashback from purchases. The offer is ONLY open to new members at ShopBack, not valid for existing users. ShopBack reserves the right to immediately close all ShopBack accounts or decline transactions and / or any cash disbursement of members who are in violation or suspected of breach of our Terms and Conditions. From 19th September to 1st October 2018 11.59PM AEST, sign up with your friend's Refer a Friend Link and make a purchase of an accumulated min spend of $20 to get a TOTAL of $12 Cashback Bonus. The $12 Cashback Bonus consists of $5 sign up bonus that is credited to your account upon sign up, plus Extra $7 bonus after making an accumulated purchase of more than $20 by 1st October 2018 11.59PM AEST. The extra bonus will be credited into your ShopBack account by 31st January 2019. Cashback Bonus can only be cashed out after user accumulates extra $10 confirmed cashback from purchases. The offer is ONLY open to new members at ShopBack, not valid for existing users. ShopBack reserves the right to immediately close all ShopBack accounts or decline transactions and / or any cash disbursement of members who are in violation or suspected of breach of our Terms and Conditions. From 1st to 10th September 2018 11.59PM AEST, sign up with your friend's Refer a Friend Link and make a purchase of an accumulated min spend of $20 to get a TOTAL of $15 Cashback Bonus. The $15 Cashback Bonus consists of $5 sign up bonus that is credited to your account upon sign up, plus Extra $10 bonus after making an accumulated purchase of more than $20 by 10th September 2018 11.59PM AEST. The extra bonus will be credited into your ShopBack account by 28th December 2018. Cashback Bonus can only be cashed out after user accumulates extra $10 confirmed cashback from purchases. The offer is ONLY open to new members at ShopBack, not valid for existing users. ShopBack reserves the right to immediately close all ShopBack accounts or decline transactions and / or any cash disbursement of members who are in violation or suspected of breach of our Terms and Conditions.